SIM type: Nano SIM. Product Type:SIM Cards Adapters. 1 Sim Card Slot. iOS support: iOS8 or later. Language: Support multi language. We strive to provide the best products and services. We are always here to help. SIMHUB is combined with a flexible circuit board and a specially designed card holder, so that two SIM cards can be inserted into the iPhone without external devices. The powerful on-chip processing program, combined with APP, allows the iPhone to hold two SIM cards. SIM type: Nano SIM. Our mission is to let your iPhone get dual sim support! Including special ICCID to unlock iPhone. Product Type:SIM Cards Adapters. 1 Sim Card Slot. Your expectations, iPhone dual cards. 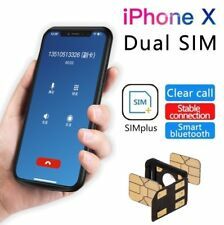 The X-Twin X Dual SIM adapter allows you to makephone calls, send / receive your SMS / MMS, access your data and surf the Internet in 3G or 4G with your 2 SIM cards on a single iPhone X. Dual SIM Card Adapter for iPhone 10 X/XR/XS/8/7, PLUS / iPhone 6, 6 , iPhone 6s and iPhone SE fits for IOS 7, IOS 8, IOS 9. Model: K1S. 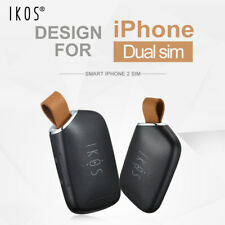 1 x IKOS K1S Bluetooth Dual SIM Adapter. SIM card adapter, dual SIM, dual standby. SIM card type: Nano SIM. Clothes & Acc. iPod Touch 6. Support the user device via a Bluetooth connection to remind function (App successfully connected, pop-up window within the App shows successful connection). Compatible with iPhone 5, 5S, SE, 6, 6Plus, 6S, 6S Plus, 7, 7Plus, 8, X. - Our dual SIM adapter allows to use two SIM cards. 1 Piece Dual Sim Adapter. 1 Piece Sim Card Tray. - Material: Plastic. (Other countries or remote areas may take longer.). OEM Sim Single Card Dual Card Tray Holder+Needle For iphone XS MAX XSMAX 6.5"
Dual Sim Card Tray Slot Holder + Tools For iphone XS MAX XS MAX 6.5"
The new SIMHUB is funding on INDIEGOGO. SIM type: Nano SIM. Product Type:SIM Cards Adapters. 1 x SIM Hub. Your expectations, iPhone dual cards. iOS support: iOS8 or later. Language: Support multi language. Dual Sim Card Adapter for Apple iPhone 5 5C 5S. The adapter connects your current iPhone's Micro SIM with another normal size SIM card. No need to cut your SIM card. Switch between two SIM cards in one Phone. Double Standby GSM Dual SIM Case Waterproof Cover Backup Battery For iPhone 6 Plus 5.5" Description Item Material: Polycarbonate with Li-polymer battery Capacity: 5000mAh Item Model: For Apple iPhone 6 Plus 5.5" Dual Card, SD and SIM Card Color : Rose Gold Features Can recharge your iphone while using Put a sim card in the case sim slot, then you will have 2 mobile phone nos standby in one mobile phone. Perfect match iPhone 6 Plus, not only it is a protecting case but also it is the second phone Imported polymer batteries, absolutely safe and reliable Package_Included 1 x iphone 6 Plus case with mobile phone (Rose Gold color) Note: iphone is not included. Kumishi for iPhone 7 Plus 2 in 1 Dual SIM Card Adapter TPU Back Case Cover. 4GB RAM 64GB STORAGE. NOKIA 8 TA-1052 POLISHED COPPER. EXCELLENT CONDITION. Top Quality 24kt Gold Special Edition iPhone Xs Max. The phone was produced in 2018. Plating: AAA Quality 24kt Gold Plated. Surface back: Polished 24kt Gold Plated protected with Clear Foil. Surface sides: Polished 24kt Gold Plated with Engraving protected with Clear Foil. Kumishi 2 in 1 Dual SIM Card Adapter TPU Case with SIM Card Tray / SIM Card Pin for iPhone X Dual Card Single Standby. The new SIMHUB is funding on INDIEGOGO. 1 x Seperator. SIM type: Nano SIM. Product Type:SIM Cards Adapters. 1 x SIM Hub. Your expectations, iPhone dual cards. iOS support: iOS8 or later. Language: Support multi language. Bluetooth Adapter Dual Sim Standby For iPhone X Power Bank Charger Case Peel What is this gadget ? This is a battery case for iPhone X This is ultra thin battery case with only 6mm and only increase the overall length by 5mm This case with a sim card slot for GSM sim card, so that your iphone will become a 2 sim card standby iphone This is a protective case with cover the whole iphone with high-end aluminum frame This case can share with your address book so that you can also access it while using the phone case sim card This case with independent message box so that it will not confuse with your iphone sim card message. This case with a button for you to charge the iphone in case of need. You just need to insert the sim card in the phone case, install the apps in the iphone. Then co.
SIM Dual SIM (nano-SIM ). Audio 3.5mm jack No. For Apple Warranty, they only provide 1 year local warranty. E.g. : HK version so it is Hong Kong 1 year warranty. This part is not included in our service. Top Quality 24kt Gold Special Edition iPhone Xs Max. The phone was produced in 2018. Plating: AAA Quality 24kt Gold Plated. Surface sides: Polished 24kt Gold Plated with Engraving protected with Clear Foil. 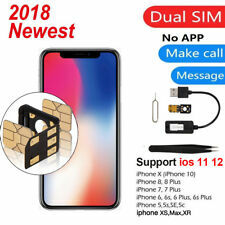 For iPhone 8 Plus Dual SIM Cards Adapter Kit with Soft Protective Case.